Anne Morrell Robinson has fibre in her genes. Her ancestors were quilt makers, weavers, embroiders, knitters and seamstresses. She started sewing as a child, making doll clothes and then moved on to making her own one-of-a-kind garments. The revival of quilt making in the 1970’s inspired her to start designing and stitching her own quilts. With almost 600 quilts to her credit she still finds great joy in the whole process. With what seems like an endless supply of fabric and ideas waiting to be turned into quilts and rugs the journey continues. Anne also makes hooked rugs, art dolls and jewelry. Artworks can be purchased at her studio – KingRoss Quilts and Fibre Arts as well as local galleries. 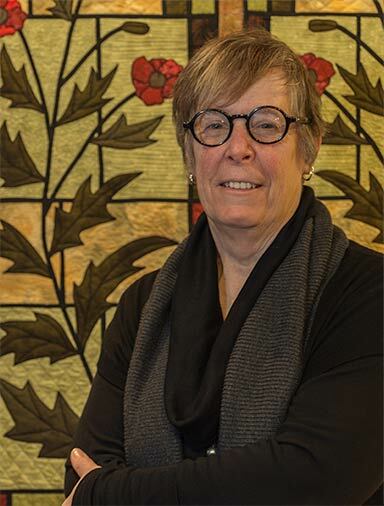 Anne Morrell Robinson is one of Nova Scotia’s most renowned quilters who has won many awards for her work and has written numerous articles for quilt magazines. She also enjoys teaching and inspiring her students to do original work. Anne’s studio is attached to a restored century old farmhouse nestled in an off the beaten track valley located in the heart of Cape Breton, Nova Scotia. Her work is influenced by the history and environment that surround her.